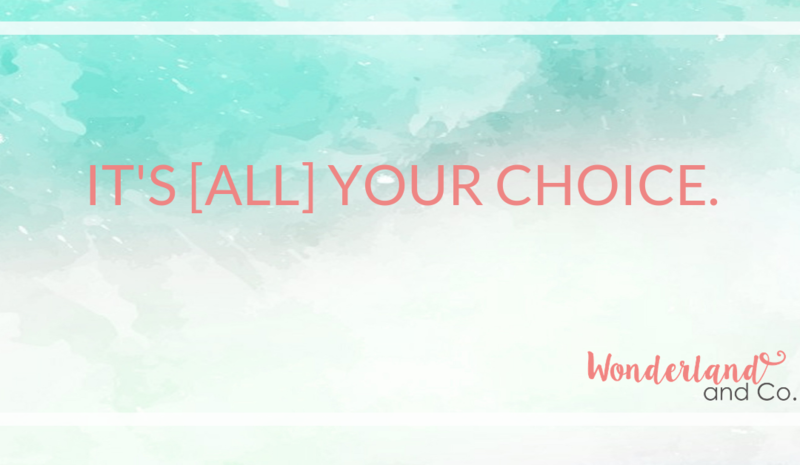 It's [all] your choice - Wonderland & Co.
Well, here we are, talking about choices; and I have really struggled with what to write. This is unusual for me, since I, like Adam, don’t typically struggle with making choices. When it comes to shopping, choosing from a menu, deciding what I think or deciding to do something (like go back to school for my master’s degree or starting coaching training), I’m all over it. I can choose an entire outfit from the doorway to my favourite shops (seriously—ask my mom). I take a look and I follow my instincts. Rarely do I feel particularly torn, nor do I tend to waste a lot of time regretting the road I took at the fork in the road. So, why am I having a tough time with this post (and last week’s, which never actually materialized, in case you thought you’d missed it)? Well, it could be because I’m in breakdown: The less-fun, yet entirely necessary prerequisite to a breakthrough. In Breakdown City, choices are fanciful things for me to make. In Breakdown City, I’m sort of like a shadow of my former self. It can seem awfully difficult to let the light shine in, kind of like swimming up and up and up, yet still not quite breaking the surface. In these moments, I dig my heels in. I actually hold on tighter to whatever miserable thing I’m using to repeatedly whack myself over the head (sound like fun? Does it sound familiar?). Not because I particularly enjoy it (in case you thought I did, I actually don’t), but because I can’t see anything else to choose. “Bay, do you know how to catch a monkey?” I was asked in coaching training. Ha! Does an anthropology major know how to catch a monkey! Of course I did; I did really well in primatology, thank you very much. Not that I liked where the question was leading (and I guessed our trajectory immediately). To catch a monkey, as the story goes, you place a banana, or some other enticing treat, into a container with a narrow mouth. The monkey can reach in and out freely, until she (it’s a girl monkey in my story) grabs the treat in her hot little fist. The tight little fist no longer fits through the opening and the monkey can’t let go of the treat. Well, she could, but the thought doesn’t occur to her. You can catch a raccoon in a similar fashion. Now, do I enjoy being compared to a monkey or a raccoon? Not particularly (and let me tell you, as soon as I heard, “Do you know how to catch a monkey?” I dug those heels in even farther!). But is it true? All too much so, I’m afraid. All I needed to do is to let go. Choose something else (anything else). Choose anything different from what I currently was holding and grab that instead. Simple enough, right? Easy peasy, lemon squeezy. But the thing is, it’s really hard to choose something different, when you’re stuck. I know this for a fact. Those wagon ruts are deep! On a bicycle, if you try to get out of them, you’ll need to pedal a lot harder. Probably, you’ll need to jump. If you don’t have enough momentum, you’ll fall over. Now, you’re still in the rut and you’re sore/embarrassed to boot. But each time you try, you get a little stronger. A little braver. What’s that? You don’t know what to choose? Great! Now you can pick something new! So what’s the trick? How do you choose when you can’t see any choice? Well, start small. Choose something that is different from what you are currently stuck with. Choose anything that is different that whatever it is you are holding in your tight little paw. There are literally an infinite number of things from which to choose. Maybe it’s compassion or forgiveness (both are probably required), but those two might be a long way off from where you are currently stuck (that’s kind of like the advanced course in choosing). Remember, when we stay still for a long time, our muscles cramp and weaken: You may need to choose something simple, just to get moving. Does this sound familiar? Are you aware when you’re choosing with your hand caught in a jar? Can you think of a time when you’ve chosen something different? That’s a “pretty good” story. Why you might try quitting things. Even Though You ALREADY HAVE Everything You Want.